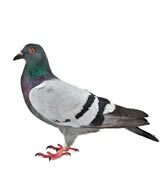 Pigeons are a part of life, but not when they’re in your home. Critter Control of Orlando has a staff of highly trained wildlife removal experts on hand, ready to safely and humanely remove animals from your home that shouldn’t be there. It’s not uncommon to have pigeons roost in attics in Orlando. When they do, they often spread droppings and damage the walls. Also, like most wild animals, there’s the chance that they carry parasites or diseases which could pose a threat to the health and safety of your family and pets. To ensure the safety of your family and the animals in question, we recommend calling in a professional to remove pigeons from your home. We’ll take you through every step of the process, from a free initial home inspection to fully understand what’s going on, to a tailored removal plan, to finally modifying your home to bar the pigeons from reentering, ensuring the problem won’t arise again. To learn more about Critter Control’s pigeon removal services or to set up your free home inspection, please give us a call today at 407.295.7194.